The team here at Cultured Canines is the heart of our business. Our amazing trainers have gone through over 100 hours of hands on and classroom training so they are able to tailor their support for each individual dog and owner. Every instructor has their own approach and their own training experience to bring to the table. This is not just a job for our instructors. All of our team members are here because they loved the relationship they were able to build with their dogs as Cultured Canines clients before they became trainers. They are passionate about sharing their knowledge and helping you achieve your goals with your dog. Before I became a dog trainer, my first dog, Jett and I were at the off leash park when he saw another dog across the street. Jett ran after it, and was hit by an SUV and died shortly after in my arms. This was, without a doubt, the worst day of my life. My family and I were convinced that Jett’s behaviour was “good enough” so we never did a proper training class with him. We just used treats to bribe him to listen. After this horrible incident, I got a new puppy, Jake! I was determined to do everything right with him. I took a course through Pawsitive Dawgs with Jake when he was four months old, and we loved every minute of it. I saw that the training organization that Pawsitive Dawgs was a part of was offering a course in Calgary to become a trainer, so I jumped at the opportunity (the course was usually only taught in Kelowna). After a year of hard work and dedication, I received my training certification. I became a dog trainer so that I could help show dog owners that having a dog that is “good enough” is not enough. I don’t want anyone to have to endure what my family and I went through with Jett. The single biggest killer of pets is not disease; it is behavioural problems. I want to help you have the best possible relationship with your dee-oh-gee! The relationships I have been able to build with my three dogs, Jake, Leia and Kirk, has shown me just how amazing and complex the relationship between dogs and humans can and should be. I love helping people have this level of understanding with their own dogs. Nothing makes me happier than seeing the bond between a dog and their owners grow and blossom. For as long as I can remember, animals, and in particular, dogs, have been a huge part of my life. I knew I was meant to work with and around dogs someday. I am a huge advocate for treating all dogs equally no matter what their breed, size, or age. I want to change the worlds view about the Pitbull breed which is why in 2011 I got a bluenose Pitbull, Harlem, who is a perfect ambassador for the breed. My love and passion for dogs led me to help out by fostering for AARCS. After about six months of fostering Willy, I realized I needed some extra help with his training. He had some behavioral issues that I was just not equipped to deal with, which is what led me to Beth and Cultured Canines. I initially tried a positive only trainer but had minimal success, so I contacted Beth to see if she could be of help. Within a few classes I saw improvements with Willy and quickly realized not only how beneficial “no treat” training was, but also how beneficial the outdoor group classes were. It was a no brainer to me that this was the type of dog training I strongly supported and needed to be a part of! I am proud to be able to assist individuals and their dogs with any and all behavioral problems, and more so witness the same amazing relationship between dog and owner develop, that I share with my three dogs!! not for me, I desperately wanted to form that powerful bond with my dog without using food to do it. group was the one for me. Dogs have been a part of my life since I was born. I grew up with all sorts of animals, but dogs just have something about them that truly makes them your best friend, the most loyal friend of all. After the passing of our first dog, we got Nala. Life just isn’t the same without a furry friend to spend time with. Unfortunately, Nala was more than I could handle with the treat training knowledge I had, she was not interested in listening and I was at my wits end. We did a ton of research and finally found Beth. Her “no treat” training, outdoor classes and overall approach sounded perfect for our energetic, and slightly out of hand puppy (the OG Land Shark!). I have never had a bond with a dog quite like I have with Nala and it is something I can attribute to the training and hard work. I knew that Cultured Canines and their methods was something I could 100% stand behind. It is so fulfilling helping people gain a relationship with their dog that is everlasting, while also having a well-behaved dog they could be proud of. Seeing the changes in both owner and furry friend throughout the courses is something I am happy to be a part of. I first discovered Cultured Canines in the summer of 2013. At this time I had a husky who was extremely independent and had very little food motivation, treat free training was the perfect balanced training that my dog required. In the winter of 2017 I found Mya at the Cochrane Humane Society. Before I picked her up I registered for the first COOL course of that year. 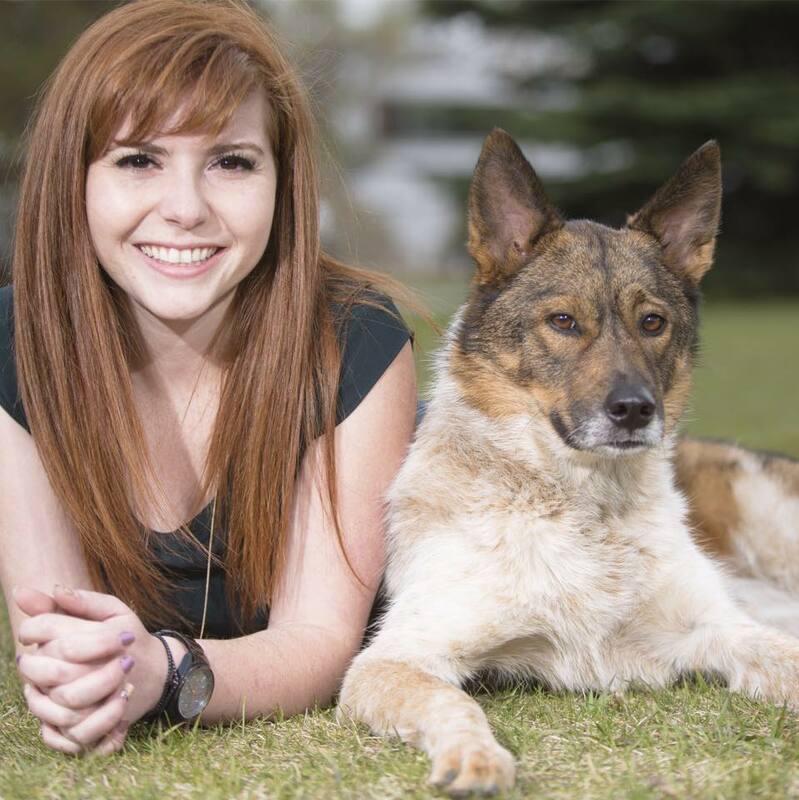 Mya has grown and overcome many behavioural challenges by being part of Cultured Canines. Over the past year I have built a relationship I never thought would be possible with Mya. I love working with people and helping them find the best solution for their dog’s behaviour. between other owners and their pups!